A couple weeks ago, my family spent our summer vacation on Poipu Beach in Kauai. We enjoyed 7 beautiful days in paradise. Sure, we've been to Hawaii before. In previous trips we had spent time amid the hustle and bustle of Waikiki Beach on the island of Oahu and we also have enjoyed the the slightly slower pace of Kaanapali on the island of Maui. But staying on Kauai is just pure relaxation. We stayed at the Marriott Waiohai, where each villa is furnished with a full kitchen, which we took full advantage of to make our meals and pretend we were residents in paradise. Our hardest daily decision was do we either go to the pool or the beach. We also got in some sightseeing and there was a reason why they call Kauai the Garden Island -- it is lush and green and you can see beautiful flowers and plants at every turn. Of course on every trip I need to find a local ice cream shop. On this trip we stopped by one gelato shop, Papalani Gelato and we also visited a Hawaiian ice cream institution - Lapperts ice cream. Both the gelato and ice cream hit the spot in the warm island breeze. One of the flavors I enjoyed most during my visit to Lappert's was the Coconut Macadamia Nut Fudge. 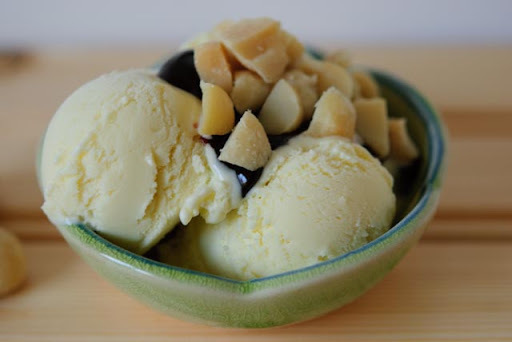 The combination of the sweet and creamy coconut ice cream with freshly toasted and buttery macadamia nuts and a hint of chocolate fudge satisfied my quest for finding the perfect flavor combination for Hawaii. So to relive our summer vacation, I decided to recreate a taste of paradise. I present you my version of Coconut Macadamia Nut Fudge. Heat up the coconut milk, 1 cup of the cream, sugar, and salt in a medium-size saucepan over medium heat. Stir the milk and cream until the sugar dissolves and the mixture begins to slightly boil. Then temper the egg yolks with the ice cream base. Pour the tempered eggs back into the sauce pan and when the custard reaches 170 degrees F place the ice cream base in a heat proof bowl, add the vanilla extract and toasted coconut shreds, and let it sit over an ice bath. When the mixture has cooled, place in your refrigerator for at least 4 hours. Follow your ice cream maker instruction for churning. 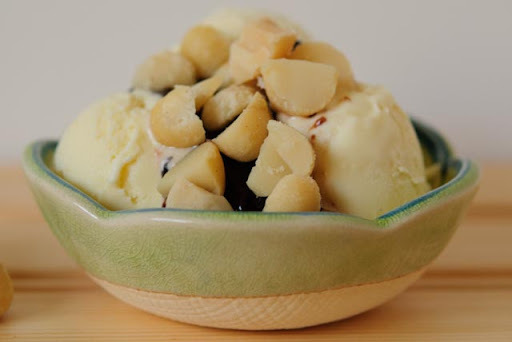 Once your ice cream has reached a softserve consistency, add the toasted and chopped macadamia nuts. Top off with hot fudge when you dish it up. Sit back and close your eyes and just imagine the tropical breeze blowing and the sounds of the island while you enjoy every scoop of paradise.